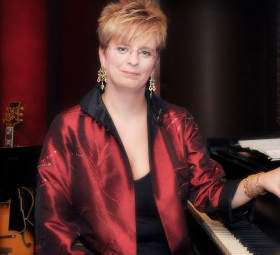 A respected jazz pianist, composer and educator, Lori, along with her husband Roger Spencer, has been living in the Nashville area since 1988. In addition to directing production shows and conducting musical theater, she has performed with artists such as Dizzy Gillespie, Red Holloway, Jimmy Smith, Cal Collins, Roy McCurdy, Terry Gibbs, Pete Christlieb, Ed Thigpen, Houston Person, Kevin Mahogany, Everett Greene, Kirk Whalum, Anthony Wilson, Oscar Castro Neves, Bobby Millitello, Marvin Stamm, Ann Jillian, Edie Gorme and the McGuire Sisters. A native of Anderson Indiana, Lori received a Bachelor of Music in Jazz Studies from Ball State University in Muncie, Indiana. Lori’s CD “Welcome to Brazil” was nominated for “Best Jazz Album of the Year” by the Nashville Music Awards in 1997. Lori and her husband Roger are the founders and she is currently the Executive Director of Nashville’s first jazz school, The Nashville Jazz Workshop. Lori released her second CD, “Shiny Stockings” in 2003. It is devoted entirely to the music of Count Basie. All the arrangements were adapted from the original Big Band recordings and played by the Lori Mechem Quartet. In May of 2005, Lori teamed up with Village Square Music and together have produced an exciting CD, “Brazillian Christmas”. On this project, Lori is joined by her group, Ritmos Picantes, featuring: Denis Solee – Saxophone and Flute, George Tidwell – Flugelhorn, Pete Huttlinger – Guitar, Roger Spencer – Bass, Chris Brown – Drums and Dann Sherrill – Percussion. In 2006, the Lori Mechem Quartet recorded a live CD with saxophonist great, Pete Christlieb. The CD received great accolade and rose to #8 on the jazz charts! 2007 proved to be yet another successful year. She recorded a CD with long time friend and co-writer, Donna McElroy. “Fly to Forever” showcased nine of their original tunes, most of which were written in the 90’s before Donna moved to Boston to teach at Berklee College of Music. While most people know Lori as a jazz musician, her next project, “The Dream of Life”, was based on other important, personal elements of her life; songwriting and spirituality. Recorded in her home in early ’07, this solo piano CD includes 12 original meditation songs, all written or co-written by Lori. The songs take you on a journey of where we begin, where we end and how we come back into a new life. In January 2009, Lori and her quartet released their second CD tribute to Count Basie, “April in Paris”. Enhancing this CD, was a guest appearance by Pete Christlieb. In March 2009, Lori recorded a new project for Green Hills Production. This CD is a tribute to Antonio Carlos Jobim, “Return to Ipenema”. Beautifully arranged by Jeffery Steinberg, this CD is one of her very favorites! In 2011, Lori and her quartet released yet another Christmas project from Green Hill Production “Christmas is Coming,” A tribute to Charlie Brown Christmas. It features Lori on piano, Roger Spencer on bass, Chris Brown on drums and Andy Reiss on guitar. Lori and her husband Roger were awarded a “Jazz Heros” award from the Jazz Journalists Association in May 2011. 2013 has proven to be a very exciting and busy year for Lori. She has appeared on several CD projects as a guest, and in August she recorded a duo CD with her longtime friend Sandra Dudley. This project is a tribute to the lyrics and music of Alan and Marilyn Bergman. The Bergman’s personally sent Lori and Sandra six tunes to consider. They decided on 3…..two of the tunes have never been recorded. “All of my Life” will be released November 17, 2013 with a celebration at the Nashville Jazz Workshop.